Discovered 1780 by Charles Messier. 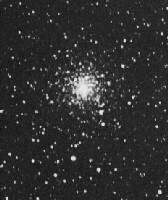 Messier 70 (M70, NGC 6681) is one of the less bright and conspicuous globular clusters in Messier's catalog. Appearing roughly as bright and big as its neighbor M69, globular star cluster M70 is indeed only a little more luminous and little bigger, and almost at the same distance (29,300 light years). Both are quite close to the galactic center, so they are both subject to quite strong tidal gravitational forces. As it is also at about the same southern declination, it is a difficult object from Paris where Messier observed it. Charles Messier discovered this globular on August 31, 1780, and described it as a "nebula without star." William Herschel was the first to resolve this globular cluster into stars and describes it as "a miniature of M3." M70 is 8.0 arc minutes in apparent angular and roughly 68 light years in linear diameter, its bright visual core being only about 4'. It is rapidly receding from us, at about 200 km/sec. Only 2 variables are known in this stellar swarm. The core of M70 is of extreme density, as it has undergone a core collapse somewhen in its history, similar to at least 21 and perhaps up to 29 of the 150 known Milky Way globulars, including M15, M30, and possibly M62 and M79. Globular cluster M70 became famous in 1995 when the great comet Hale-Bopp was discovered near it by Alan Hale and Thomas Bopp as they were observing this globular.